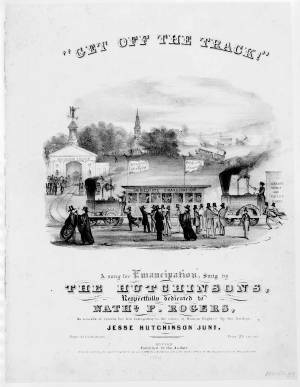 An illustrated sheet music cover for an abolitionist song composed by Jesse Hutchinson, Jr. The song is dedicated to antislavery editor Nathaniel Peabody Rogers, "As a mark of esteem for his intrepidity in the cause of Human Rights." It is illustrated with an allegory of the triumph of abolitionism. In a landscape a railroad car, "Immediate Emancipation," is drawn by a locomotive named "Liberator" and followed by another locomotive, the "Repealer," which pulls a second car "Liberty Votes and Ballot Boxes." The "Liberator" was the name of a prominent antislavery newspaper published in Boston by William Lloyd Garrison. "Repealer" probably refers to the Irish insurgent movement in support of the repeal of the Legislative Union, a cause with which many abolitionists in the United States were allied. Flags bearing the names of two other abolitionist publications, the "Herald of Freedom" and "American Standard" (i.e., Rogers's" National Anti-slavery Standard), fly from the "Emancipation" car. The trains approach a bend in the track, nearing a station where a number of people gather to welcome them. Beyond the station is a church. In the distance two other trains, one marked "Van" and the other "Clay," crash and their passengers flee. These allude to Democrat and Whig presidential hopefuls Martin Van Buren and Henry Clay. The reference to Van Buren suggests that the music-sheet appeared before the Democratic convention in May, when James K. Polk, not Van Buren, received the party's presidential nomination.